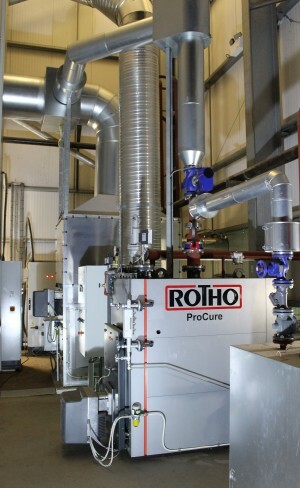 ROTHO is the world wide leader of concrete curing systems, pre-fabricated concrete curing racks, industrial air circulations systems, and more. All concrete curing systems are designed, produced, and prepared at their site in Germany, so dimensional accuracy, quality, and global service with our own assembly staff is guaranteed at all times. In concrete batching plants, you want to ensure your curing systems and air circulation systems are of the highest quality so you can depend on them to work every day without fail. These systems aren’t always the first consideration in a concrete paver plant, but their continual and flawless operation is crucial to keeping your business operational. If a curing rack breaks, or a circulation system shuts down, it could bring your automated concrete batching plant to a halt. For this reason, it’s important to only source the highest quality ROTHO concrete curing systems when installing a concrete production plant. For more information on the type of concrete curing systems we offer at ISI, or to place an order, give us a call today!